Get it done right the first time! We Keep You "Happy and in Hot Water"
Spa-Tech Spa Repair is Orange County, California's best value for skilled spa and hot tub repair service. With over two decades of experience, we've serviced almost 40,000 residential spa and hot tub owners throughout North and South Orange County. Run by spa industry expert, Jim Nance and his team of certified and factory-trained technicians, you can trust that we'll keep you "happy and in hot water" with our skilled repair work. Our technicians are qualified to repair all major spa and hot tub brands, including Artesian, Catalina, Sundance, Coleman, Freeflow, Maax Spas, and more. We repair portable and above ground spas, and perform parts repair, leak repair, and upgrades for broken and outdated equipment. Selling spa parts and supplies such as heaters, pumps, filters, controls, chemicals, and accessories are also part of our repair service. For expert hot tub and spa repair service, schedule an appointment with Spa-Tech Spa Repair today. 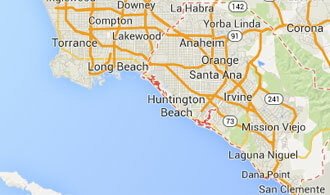 Our technicians services the entire region of Orange County. I was fortunate enough to find Jim 9 years ago and have him work on my spa. He is a good guy and the only one I will trust to work on my spa. He knows my spa inside and out and has kept my 23 year old spa in working order.